this used to be me. all of the time. when we lived in wisconsin, we were always busy. there was always somewhere to be or something to do or someone to see. busy busy busy. now that i’m in a new phase of my life, i realize that we were always so busy and our schedules were always so packed because we let them be. we were constantly running around and wearing ourselves out because we never said no to anything. i can say this now because i’m not that busy anymore. when you don’t live close to family and friends, you find yourselves less and less busy and more and more able to make time for things you enjoy doing. i’m finding myself making time for some light reading at the end of the day. addison and i go for a walk around the neighborhood almost every day. andrew and i watch a tv show and just hang out after addi goes to bed. everybody is always busy. it’s like a new fad. i feel like busy has turned into the new “fine”. you know when asked “how are you doing?” people would say “oh i’m fine”. now they say “oh just busy”. busy has turned into a huge social status without us even realizing it. like if you aren’t busy, you aren’t important or don’t have much going on in life. now that i have gone from one extreme (being busy and go go go all the time) to the other (not being busy and finding more time to fill than i know what to do with) it’s easy to see how crazy life was before. 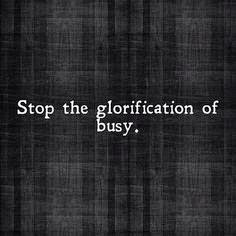 i’m still working on finding the middle ground; the not quite busy but busy enough to not be bored. a few more classes for addison, a couple more dates with the husband, it sounds quite nice actually. here’s a challenge for you this week. if you’re one who is finding yourself busy all the time, try saying no to something. if you’ve had something scheduled every night this week, say no thank you to happy hour with some co-workers and enjoy a beer on the patio in the quiet. we all need recovery time to recharge once in a while. treat yourself to a little you time. you’ve earned it. Amen! I love this post!! You are so right. I feel like so many of us are so busy that we don't ever just stop to enjoy life. I have noticed that a lot of people answer with busy. I really try to not over extend myself so that I have my down time, because that is really important to me. You are right, everyone has to find that perfect balance!